Thread: New Bike Alert! MTBR Offices! MTBR's very own Chief Code Monkey extraordinaire, MikeG has new bikes! And he's retiring his old Intense Tracer for a new Santa Cruz Nomad! 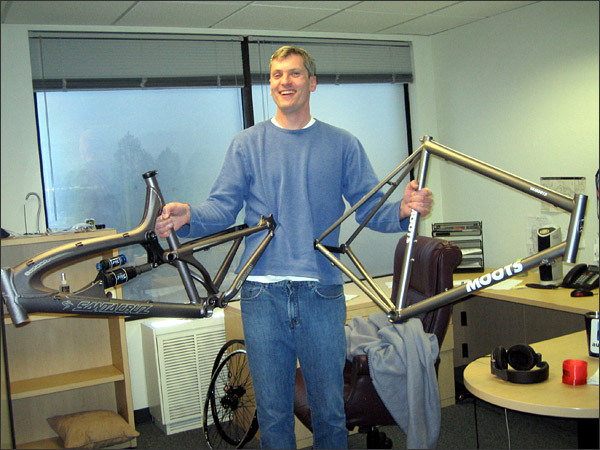 I was there with Mike on his first test ride at Interbike, and he was impressed enough to place his order. We look forward to his build. Hey, give me back my bikes. Get out of my office too!! Dude needs to get building. ASAP. It ain't a bike until its got parts. When the going gets weird its bedtime. Who do I have to bribe to get a job at mtbr.com HQ's??? Would it help writing my application on a Benjamin?? Eiw, blood. Congrats on the new ride though. No kidding - that's like me talking about my new bike that I got.... well, I placed the order, and the new fork showed up... thats almost a new bike, right? Eh, I don't think you want a job at MTBR. The don't make a lot of $$$ and that office ain't looking the shiznit. Well, I don't make much money either and my office looks for sheit... not to mention my co-workers freak out when they hear about bikes. Only one of my co-workers can tell the difference between a wheel and a pedal. I've got photos of biking all over the office. If the coworkers don't know, they learn fast. Then when we are away on business I make them rent a mountain bike and take them on rides. I haven't converted one of them yet and they are sore for weeks after. My co-workers couldn't care less... for them, their idea of "fun" does not include waking up at 6:00 on sundays, take a punishing ride across the woods, risk of falling and hurting and getting dirty overall... leave alone spending more than 100 bucks on a bike.